Isaiah Collier & the Chosen Few. Collier heralds a new generation of Chicago jazz musicians, the saxophonist having captured listeners’ attention when he was a 16-year-old student at the Chicago High School for the Arts, in 2015. He has developed steadily since then, and here’s a chance to measure his progress. 1:30-2:30 p.m., Wagner Stage, Midway Plaisance near Woodlawn Avenue. Thaddeus Tukes & Alexis Lombre Duo. The theme of youth continues with a pairing of two of the most impressive musicians to emerge in Chicago in recent years. Vibraphonist Tukes has proven himself adept in many musical contexts; pianist Lombre summons a great deal of sound and spirit. 3-4 p.m., Augustana Lutheran Church of Hyde Park, 5500 S. Woodlawn Ave.
Brandee Younger Trio. The harp doesn’t enjoy great prominence in jazz, notwithstanding the contributions of Alice Coltrane (in whose music Younger is expert). But no less than Jack DeJohnette, Ravi Coltrane and Pharoah Sanders have tapped Younger’s talents. Here she’ll collaborate with bassist Rashaan Carter and flutist Anne Drummond. 4:30-5:30 p.m., Hyde Park Union Church, 5600 S. Woodlawn Ave.
Kris Davis. You could call Davis one of the most admired, creative and prolific young pianists in jazz, though one hesitates to define her work within a single musical language. Regardless, here’s a rare opportunity to encounter her playing solo in an uncommonly intimate space. 5-6 p.m., University of Chicago’s Logan Center Penthouse, 915 E. 60th St.
Ryan Cohan’s “Originations.” Chicago pianist Cohan stands as one of the city’s most compelling long-form jazz composers, and he’ll present a revamped version of his latest opus, which will include new movements. This will be performed by a 10-piece group featuring Cohan, the Kaia String Quartet, bassist James Cammack, trumpeter Tito Carrillo, drummer Mike Raynor and reedists John Wojciechowski and Geof Bradfield. 5:30-6:30 p.m., Logan Center Performance Hall, 915 E. 60th St.
Mike Reed’s “The City Was Yellow: The Chicago Suite.” Chicago drummer-composer-impresario Reed has performed this music in France, but the suite continues to evolve, making this performance something more than just a Chicago premiere. Reed has gathered music written by Chicago composers from 1980-2010 (some newly transcribed) to create a portrait of the city in sound. He’ll lead a septet. 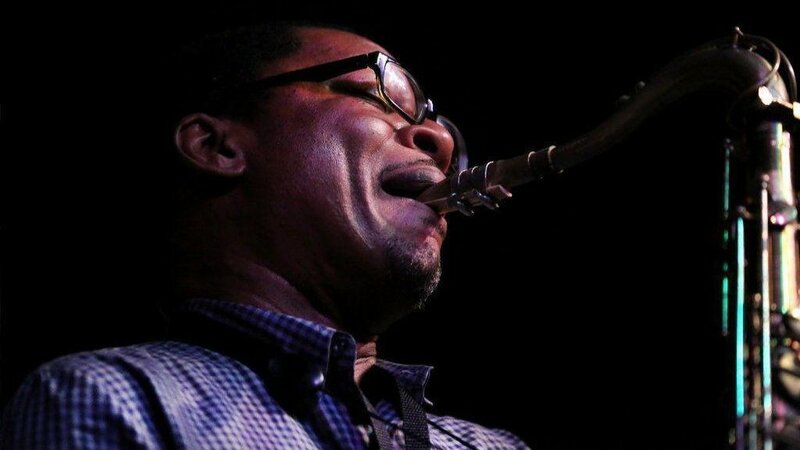 7:30-8:30 p.m., Logan Center Performance Hall, 915 E. 60th St.
Ravi Coltrane with Brandee Younger. The first day of the Hyde Park Jazz Festival always concludes with a singular, late-night performance at the University of Chicago’s Rockefeller Memorial Chapel. This time, saxophonist Coltrane will lead a quartet featuring harpist Younger, an evocation, perhaps, of the partnership between Coltrane’s parents, saxophonist John Coltrane and pianist-harpist Alice Coltrane. 11 p.m. to midnight, Rockefeller Memorial Chapel, 5850 S. Woodlawn Ave.
John “Poppy” Wright’s Pool Party Jam. In homage to the late Chicago pianist Wright, pianist Miguel de la Cerna will host a session featuring Wright contemporaries and admirers, among them Jimmy Ellis, Red Holt, Art Hoyle, Tom Tom Washington, Larry Novak and Lady T. 2-3 p.m., Wagner Stage, Midway Plaisance near Woodlawn Avenue. Kenwood Academy Jazz Band. Every time this ensemble performs, it reminds us of what high school jazz musicians can achieve. They’re led by inspiring teachers Gerald Powell and Bethany Pickens. 3-4 p.m., West Stage, Midway Plaisance near Ellis Avenue. Dee Alexander Presents: What Color Is Love? The Music of Terry Callier. No one sounded quite like Chicago singer-songwriter Callier, who died in 2012 at age 67. Chicago blues, African chant, freewheeling jazz improvisation and folk instrumentation intermingled in his music. Who could be better equipped to address all that than Chicago singer Alexander? 6-7 p.m., Wagner Stage, Midway Plaisance near Woodlawn Avenue. Jason Moran: Celebrating Willie Pickens & Muhal Richard Abrams. Few major international jazz musicians have established deeper deep ties to Chicago in recent years than pianist and MacArthur Fellow Moran. In his latest homage to music in this city, Moran will play a solo tribute to two Chicago jazz giants who died last year. 8-9 p.m., Logan Center Performance Hall, 915 E. 60th St.; $15. Haymarket Opera Company will launch its season with Handel’s ‘Serse’ (1738), featuring Suzanne Lommler in the title role, Sarah Edgar as stage director and Craig Trompeter as music director. 7:30 p.m. Saturday, 5 p.m. Sunday and 7:30 p.m. Oct. 2 at the Studebaker Theater, 410 S. Michigan Ave.; $30-$85; 312-898-7446 or www.haymarketopera.org.